Svetlana Parshina was deeply moved by her childhood reading of Twenty Letters to a Friend by Svetlana Alliluyeva, Joseph Stalin's daughter. Years later, learning that the now 82-year-old was living incognito in a Madison, Wisconsin retirement home, Parshina phones and requests an interview. After repeated denials, and only after insisting upon certain conditions, the now-82-year-old Alliluyeva finally consents to a rare filmed interview in which she discusses her education, marriages, her children, the development of her own humanistic philosophy, her CIA-assisted defection to the U.S., and her skeptical views on the competing Cold War ideologies. 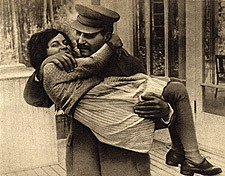 In more intimate moments, she discusses her childhood, her nanny, the suicide of her mother, her brothers Vasily and Yakov (who died in a Nazi concentration camp) and, of course, her famous father, who most Soviets saw as "a living god." Her poignant and often candid reminiscences, and a few humorous anecdotes, are combined with archival footage and photos, including numerous family snapshots. SVETLANA ABOUT SVETLANA thus offers a rare glimpse of what it was like to be the daughter of a man who had too much power. Why, and how, was Lenin mummified in 1924? And how, and why, is he still on display in Red Square today?